There’s something of the jewel about cherries – their colour, their shape, their size, the way they shine (and yes, their price!). Nutritionally, they’re even more precious, punching way above their weight. Indeed cherries make it into the top 20 superfoods when it comes to antioxidants – and that’s just one reason they’ve been the subject of over 50 studies in the last few years (antioxidants are molecules that neutralize the free radicals bombarding our cells every day and thought to cause ageing and some degenerative diseases). 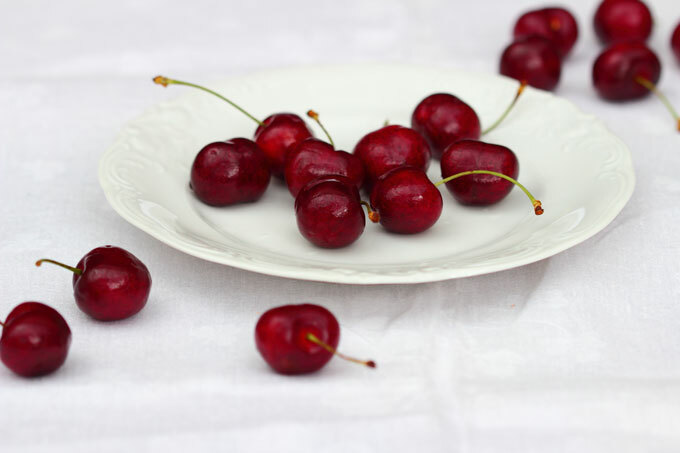 Sour cherries, sometimes known as tart cherries or Montmorency cherries, are king pin (just one cup contains 4,873 antioxidants) but plain old sweet cherries are almost as impressive, containing a unique set of antioxidants not found in any other food. Or take my word for it and go and buy some cherries right now! The best way to eat fresh cherries is in season (yes, that’s now), just as they are, straight from the bag. But with dried sour cherries and frozen cherries readily available, there’s no reason to eat cherries only in June. 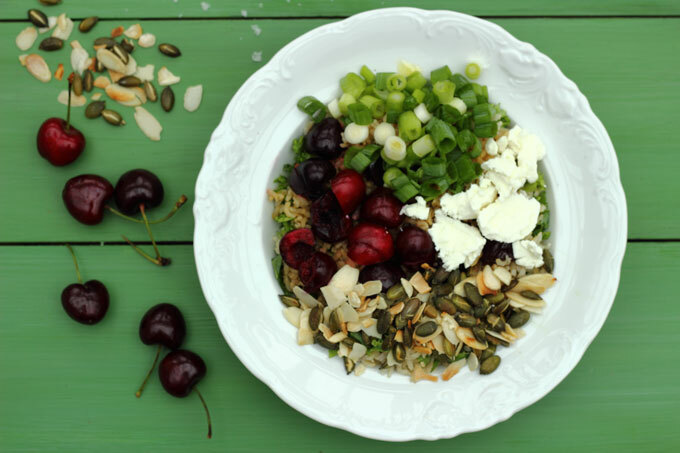 I’ve been looking at savoury dishes that use fresh sweet cherries combined with dried sour cherries and this is my all-time favourite – even Carnivorous Husband loves it! With the inclusion of brown rice, kale, almonds, pumpkin seeds and tangy goat’s cheese, this dish provides almost every nutrient going. You can replace the goats cheese with feta (or miss it out altogether), the kale with spinach, watercress or rocket, and the almonds with walnuts or hazelnuts. The whole dish can be prepared in 20 minutes. Use the freshest cherries you can find and don’t be tempted to leave the stones in (I have a stone-removing gadget that saves a lot of faffing around but Susan uses her fingers). The cherry season is short so go on … what are you waiting for? Thanks a lot! What an interesting recipe ! I had no idea cherries had so many antioxidants I’m definitely can go and buy some this weekend! Isn’t it great to have something really, really healthy and really, really delicious! Your recipes are simple yet luxuriously healthy and delicious. I am SO happy to have discovered your blog! Great writing and beautiful photography. Thank you for what you do! You make healthy food accessible and not intimidating in the least. Thank you so much, Anne. Much appreciated!